Whether you are vacationing with your fitness-minded family or bringing your college-bound teen for a campus tour at nearby University of California-Berkeley, Claremont Club & Spa, A Fairmont Hotel (aka Claremont Hotel), is the ideal urban oasis in San Francisco’s East Bay. That's why KidTripster has named it one of the Top 10 Stays in the San Francisco area. Perched atop the Oakland Hills on 22-acres, the Claremont Hotel celebrated its centennial in 2015 with an extensive restoration. Fairmont Hotels & Resorts gracefully brought the property into the 21st century with eclectic art and contemporary furnishings. Claremont guests have full access to The Club: three swimming pools, 10 tennis courts, an expansive fitness center, and the Kids’ Club. In addition, you’ll want to spend time in the luxurious on-site Fairmont Spa, award-winning restaurants, and lounges alive with jazz musicians. 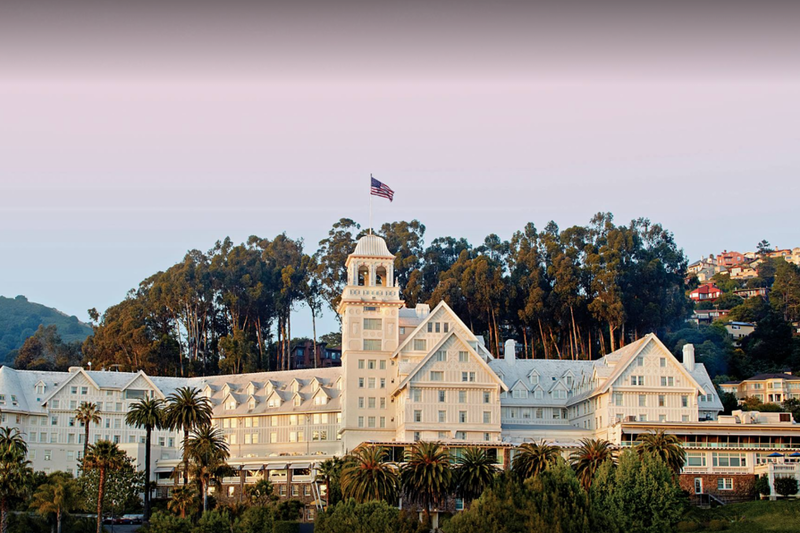 The sprawling Claremont Hotel, originally built as a private residence during the California Gold Rush, is one of the largest wooden structures west of the Mississippi River with a grand lobby and 276 guest rooms and suites. Each elegant guest room has a flat-screen TV, mini refrigerator, bathrobes, and upscale Le Labo bathroom amenities. Bayview rooms and suites are positioned to offer stunning views of the water; often both the Golden Gate Bridge and Bay Bridge are within sight. Our bayview, one-bedroom suite was spacious and elegant. The king-sized bed, topped with a down comforter, was one of the most comfortable hotel beds that my husband and I have ever slept on. Our children slept on a comfy sofa bed in the living room with their own TV for nighttime movies, a mini fridge, and a dining room table that was perfect for our room service breakfast for four. The suite had a large bathroom with two sinks, a soaker tub, and a shower with both a rain showerhead and a hand-held wand combo. The only thing that beat seeing the Golden Gate Bridge through the sea fog each morning was the spectacular sunset each evening. My whole family stood mesmerized as the sun slowly sunk below the horizon, painting the sky behind the famous span every shade of orange. Room rates start at $259/night. Suites start at $479/night. KidTripster Tip: Guests who reserve the 600-square foot Tower Suite get exclusive access to the historic tower’s rooftop deck as private outdoor space. The breathtaking bay views from this suite are unequalled. Or for a lot less money, ask at the front desk if the Tower Suite is reserved. If not, you may be permitted to go up and check out the views for yourself! The pet-friendly hotel has a Canine Ambassador. Edie, a sociable, white Boxer mix with her own doggie bed in the lobby, gently greets guests during the week. In fact, the Claremont Hotel encourages guests to bring their own dogs, offering dog beds, water and food bowls, housemade treats, waste bags, and dog toys, upon request. KidTripster Tip: On occasion, the hotel has been known to surprise young guests who are especially interested in Edie with a white stuffed animal, donning Edie’s signature pink bandana. Positioned 12 miles east of San Francisco, the Claremont Hotel is located near vibrant shopping streets in both Berkeley and neighboring Oakland, a wide range of international cuisine, and endless East Bay attractions such as museums, concert venues, and professional sports arenas. Our family’s favorite area of the Claremont was the impressive, outdoor pool area, considered the Bay Area’s best family aquatic facility. The deep, 25-meter, recreational saline pool is heated year-round, as is the shallow children’s activity pool with water fountains. The 25-yard, lap pool, complete with giant digital clocks to time your stroke, is cooler on purpose for serious swimmers in training. There is also a hot, jet-stream whirlpool. Among the countless lounge chairs that fill the enormous pool deck was a welcomed surprise to my family of “gamers.” The kids challenged Dad to a game on the giant chessboard next to the Bayview Cafe. My children had a great time hanging out at the Kids’ Club, an on-property clubhouse located near the tennis courts. The activity center has a large, outdoor play structure, indoor games, arts and crafts, and a calendar full of activities and day camps. My kids played tennis, baseball and basketball, climbed on the jungle gym, played a piano keyboard, had an art lesson, enjoyed a snack, and didn’t want to leave when I picked them up after my spa treatment. Three hours of complimentary childcare is provided per day, divided by the number of children. Standard childcare rates apply after the free hours have been used: $12/hour per child (3-hour maximum). KidTripster Tip: Every Friday from 6 to 9 p.m., the Kids’ Club has Movie Night. The hotel features a different film with dinner, popcorn, and a dance party afterward. Cost: $30/child. KidTripster Tip: The Claremont has a children’s scavenger hunt throughout the hotel. Ask at the front desk for the map and then explore the property, finding prizes along the way. The Claremont isn’t just for kids. Grown-up guests make a beeline to The Fairmont Spa in the heart of the hotel for some holistic self-care: massages, facials, body treatments, bath therapy, and couples’ treatments. If you can believe it, the spa even has views of the San Francisco Bay! From the women’s eucalyptus steam room and saline whirlpool relaxation area, you can zone out while gazing over the bay with the city skyline in the distance. Unwind in one of the full-service spa’s 32 treatment rooms at the hands of an experienced therapist. I splurged on the 75-minute aroma renewal body treatment, a relaxing and invigorating, full-body, dry brush and salt scrub exfoliation that incorporates lavender aromatherapy oils and both warm healing stone and pressure point massage. If I recall, there’s a chance that this sleep-deprived mom was so relaxed that she may have dozed off for a moment or two. One thing is for sure, I woke up with the softest skin of my adult life! UC-Berkeley’s world-renowned science center, The Lawrence Hall of Science (1 Centennial Dr.), is a popular destination for kids and adults. Get “hands-on, feet-on, brain-on” experiences touching a myriad of exhibits that let visitors design, build, and test while learning that science can be fun! Cost: Youth (2 & under) Free; Youth (3-18) $10; Adult $12; planetarium tickets: $4. Adventure Playground (160 University Ave.) at the Berkeley Marina is considered one of the best playgrounds in America. The unique, kid-designed facility encourages children to hammer, saw, and paint to create their own makeshift structures. There’s even a zip line. Cost: Free. If you're looking to explore farther, check out KidTripster's Top 10 Plays in San Francisco. Claremont Hotel keeps children in mind at every meal with kids’ menus at the resort’s Limewood Bar & Restaurant and with the 24-hour in-room dining option. Our breakfast experience at The Claremont was marvelous! To start, we were offered our choice of free morning newspapers as we walked into the restaurant. Our children doodled with crayons and worked on word puzzles on their kids’ menus. The menu includes these breakfast choices: a ham and cheese omelet with hash browns, toast or fresh fruit, blueberry pancakes, the Junior East Bay Sunrise, Berkeley porridge or mixed berries & Sonoma yogurt parfait - all $9 or under. Admittedly, my kids started their day with a bit of a sugar rush, ordering off the regular menu - pan au chocolat (chocolate croissants) and Ghirardelli hot chocolate with whipped cream. They also munched on a side of applewood smoked bacon and the yogurt parfait. Afterall, we were on vacation! I enjoyed alternating sips of coffee and a vibrant, purple Super Food Berry smoothie, followed by the most delicious stack of blueberry pancakes with powdered sugar and Vermont maple syrup. The Farmers’ Omelet, made with locally-sourced produce and cheese, wowed my husband. We found ourselves hanging out at the hotel’s incredible pool area for several hours on Saturday afternoon, so we ordered hotdogs, fries, salads, juice, and soda from the Bayview Cafe, and ate poolside, lounging under umbrellas, which is what many families do at lunchtime. Saturday night dinner was spent at the resort’s popular Limewood Bar & Restaurant that boasts more of those beautiful bay views. Limewood’s $10 dinnertime kids’ menu includes a grass-fed beef burger, a grilled cheese sandwich, pasture-raised chicken fingers, macaroni and cheese, and pasta with Parmesan. Portions were so big that the kids brought leftover chicken and grilled cheese back to our room for a late-night snack. My husband and I started dinner with what turned out to be our favorite dish during our stay - Limewood’s roasted beet, pistachio, and arugula salad. We were wise to order two, so we wouldn’t have to share. The salad was that fresh and delicious! Limewood’s dinner entrees included grass-fed beef rib eye with creamed kale and scalloped potatoes, wild King salmon and caramelized red onion ravioli, heritage pork porterhouse with polenta, and pasture-raised chicken with smoked eggplant puree and King Trumpet mushrooms. KidTripster Tip: The hotel’s concierge is obliging when you ask for off-property restaurant suggestions. Recommended options nearby include: Trattoria La Siciliana, Rick & Ann’s Restaurant, Barney’s Gourmet Hamburgers, and Shen Hua, where we enjoyed a loud but delicious modern Chinese meal of hand-made barbecue pork buns, pot stickers, spring rolls, and much more. If you're look for the best family-friendly restaurants in San Francisco, check out our Top 10 Eats list. Claremont Club & Spa, A Fairmont Hotel (41 Tunnel Rd. ), is located 12 miles from downtown San Francisco in the East Bay city of Berkeley. Oakland International Airport is 14 miles from the hotel; San Francisco International Airport is 25 miles away. KidTripster Tip: Steer clear of gridlock! Avoid traveling east on the San Francisco-Oakland Bay Bridge on Friday afternoon/evening, the worst day to travel the Bay Area’s busiest stretch of road. Journalist Wendy Thies Sell splits her time writing about California wine country and her family’s travels.